The fun's about to begin ..
165 Parliamentary seats. That's how many BN will win in GE14, or so this chap close to the ruling coalition's election think-tank wanted me to know. If so, it means these people are confident of not just getting the two-thirds but are sure PM Najib Razak will lead the coalition in crossing the 148-seat mark comfortably, almost nonchalantly even. Honestly, I get uncomfortable when people get that over-confident. In GE12 2008, some of the think-tankers were so confident BN would repeat the emphatic 2004 victory that they prayed that PAS would retain Kelantan, at least, "so that BN doesn't get too cocky". In GE13 2013, new and younger think-tankers told me with utmost certainty that Lembah Pantai would fall to BN. So, very confident one. But on both occasions they were right where it mattered most to BN: the coalition led by Abdullah Ahmad Badawi won the GE12 even though it lost the two-thirds majority in Parliament and the coalition again won the GE13, led by Najib, with 134 seats, 14 shy of the two-thirds majority. So, what I think of 165 seats? Sorry, I don't think that's going to happen. But, having said that, I did mean to ask this chap close to the think-tankers if the 165 included seats that PAS would win in the coming PRU (the Islamic party won 21 parliamentary seats in GE13). After all, if you go by yesterday's proceedings on the Anti-Fake News Bill in the Dewan Rakyat, the BN and PAS MPs voted as if they were a coalition. 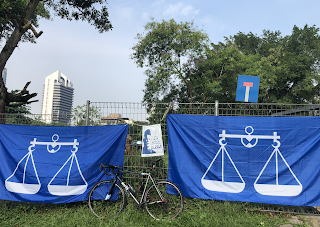 A sign of things to come after GE14?